Gayle Romasanta is a writer, editor and publisher. Her independent book press, Bridge Delta Publishing, is inspired by her upbringing and grandfather’s farm that took 3 bridges to get to along the California Delta, it’s focus is on stories about the Filipino American experience. Gayle grew up amongst the manongs, experiencing their unique stories as well as her own as an American. She’s worked creatively and as a writer for years, focusing now on stories that are relevant to all ages and familiar to Filipino Americans. Gayle has partnered with the late Dr. Dawn Bohulano Mabalon to write Journey for Justice, the first Flipino American history book for children. 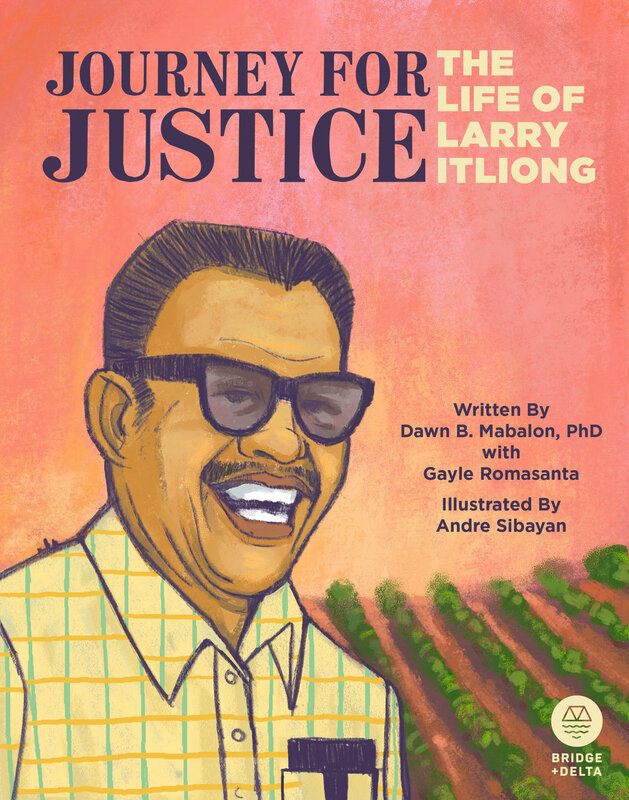 It tells the story of Larry Itliong’s work in the farmworkers’ union. The nationwide tour for Journey for Justice begins in Delano, CA on February 8. How did your interest in writing begin? How did you create your career path? I always knew I wanted to be a writer, in media and music (my first artistic love was playing the violin). I was an avid reader and read everything in the house. I read novels, nonfiction, poetry, magazine, essays, just about everything and anything, I read. My parents would take me to the library a few times a week. That’s how much I read. That was my favorite place to be. Looking for books. In high school I was on newspaper and even hosted a radio show on 91.3 FM KUOP called Progressive Connection. I even took articulation classes. Then I went to Long Beach State. I majored in creative writing and while I was an undergrad, I was invited to become a congressional intern in the late 90s. I went to Washington DC and finally felt what the east coast was like and I gave me such a new perspective. I saw people of color in positions of power and creating and voting on policy! When I talked to my mentor at the time, I told her I wanted to learn more about politics, how things worked, and the language of power. And she told me to go to San Francisco, I would learn a lot. So I decided to go to San Francisco. But before I left Long Beach State, I started Kappa Psi Epsilon (about 23 years ago), a Filipino culture based sorority. It is now at UCLA, Long Beach State, San Francisco State, CSU Sacramento, and UC Davis. In San Francisco I wasn’t sure how I was going to merge my love of the arts, politics, reading and writing, but I tried to do them all in my 20s. I was involved in student organizing, writing, theater, playing the violin and touring with the Bobby Banduria Band. Then I attended California College of the Arts and received my Master of Fine Arts in Writing (after a one year attempt at law school). From there, I made up my mind I wanted to earn my living as a writer and as an artist. It hasn’t been the easiest path to follow. But it has always brought me joy to create. What is the inspiration behind Bridge Delta? The mission behind books for Filipino Americans? Bridge and Delta is an homage to my childhood. We would cross over 3 bridges to get to my grandfather’s farm. I dedicated Journey for Justice to the 8 brothers and cousins, manongs on my mothers side, they bought a farm right next to the delta. I grew up with the manongs. That was my upbringing. I grew up knowing what it meant to be American, an immigrant and family that has been separated due to immigration laws beyond my control. I hope telling these stories about our history, students, families and learning communities can see themselves in these books. I hope it gives students the love and inspiration to tell and fight for their stories to be heard and valued. What kind of books do you want to write/provide for Fil Am youth? I love modern books, accessible to all ages. Books that really can identify and address the specific issues that we face, the stories that are similar or familiar for many Filipino Americans. What specific stories do you want to tell? Stories that are relevant for our families and students and teachers. How have your books been received by the Fil Am community? It’s been amazing. And bittersweet since Journey was Dawn’s last book. She was a friend to many. A beloved community member. Her work was able to reach around the country. For that I am grateful we have something from her, one last book. I’m excited that the community has embraced Bridge and Delta, the Beautiful Eyes books and Journey. I hope we continue to keep putting out relevant story telling that helps us raise readers, with critical thinking skills and heart. Are there writers or artist/illustrators you would like to collaborate with in future books? I’m so grateful. I’m already working with some pretty cool people that I haven't yet formally announced. I’m always working with my family, I hope to do that again in book form. It’s fun. I have 4 kids and even after managing all of these guys, I can still go to a coffee shop or go in a room and work for 8 hours straight and continue working. It’s hard, it’s not easy. But I love it. I think life is hard in general, you might as well love what you do. For The last 13 years it would have to be having children. Because I had kids, I was very specific in my goals. No matter what, I had to have 1-3 publishings a year and because I no longer live in the San Francisco Bay Area, I had to bring the work to me. I knew I still had to be an artist. To be strategic and set the goals as a mom, made me grow as an artist and be targeted with my time and energy. You have two events in LA this coming weekend, can you talk more about them? There will be a book signing at Dawn’s tribute at UCLA on Saturday, January 26. It’s for the Southern California community to pay tribute to Dawn. There is also a signing at the Park’s Finest on Sunday, January 27. We are doing a short program of a Q&A, showing a video with Dawn talking about the book project. It is 11am - 1pm. We also have the kick off for the national book tour for Journey in Delano February 8-10. It’s a three day event with historic tour, panels, performances and more. There will also be breaking bread with everyone and eating together. All free to the public. There will also be a limited amount of free books available to the public as well. Check out www.bridgedelta.com for more info and to rsvp. All photos courtesy of Gayle Romasanta. Profile photo by Gena Roma Photography. I know Dawn would have wanted her work to get out as far as possible. I’m proud were doing just that.